How Much Does a New Fence Cost in Texas? If you’re thinking about getting a new fence in Texas, you have a lot to consider. You’ll need to choose a contractor you can trust and you’ll need to determine just what you want your fence to look like. You’ll also have to think about the price. Getting a new fence isn’t always cheap, but you can help keep your costs down by understanding the different factors that influence its price. Chain link fences are a popular option for an economical and easy-to-assemble fence. They are good for keeping animals and children in (or out of) your yard. However, they aren’t very durable and can rust quickly, and some people don’t like the aesthetics of chain link fence. Wood fences are the most common and popular type of fence for homeowners. They offer a great balance of quality and price, and a well-built wooden fence also looks good. However, wood fences also have durability issues. As they age, wood fences break down, rot and warp. Different types of wood can vary widely in terms of quality and durability, but all wood fences will break down eventually. Vinyl fences are higher in price than wood or chain link fence, but they also represent the best in terms of lifespan and quality. 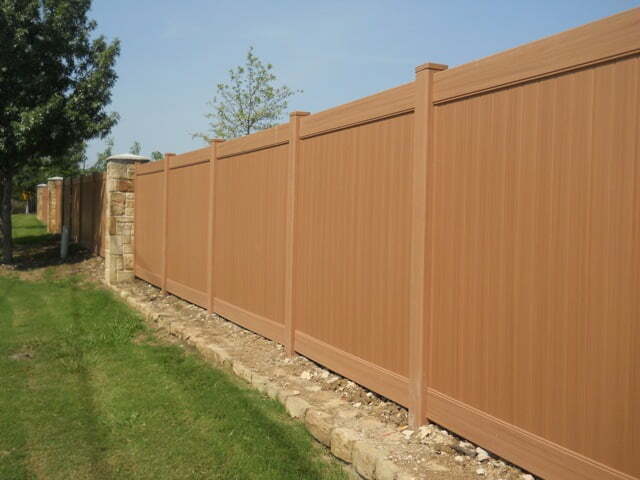 A vinyl fence is extremely durable and will last for a lifetime. Plus, even though they are more expensive at the outset, they have the longest lifespan of any fence type and need the least maintenance, meaning they cost less over the long run. If you’re not sure what type of fence is right for you, it’s important for you to decide what factor is most important. If you are most concerned about durability or looks, you should consider a vinyl or a high-quality cedar fence. If you are mostly looking at price, you can get quotes for different types of fence and compare costs directly – most fences are priced per linear foot, so it makes materials costs easy to compare. Also, keep in mind that the design of the fence can influence the material cost as well. Different designs, such as semi-privacy fence or accented fence, can affect your fence’s price. Make sure you keep this in mind as you’re looking at fence prices and types. Along with the material itself, labor costs make up a significant part of having a fence installed. Fence contractors have varying rates for labor, but they’re almost always willing to discuss their rates with you before they start work. Slopes on your land that necessitate special building techniques or alterations to the fence panels. Limited access to your property which prevents your contractor from bringing equipment or materials to your building site easily. Pre-existing structures, landscaping features, or plants that the contractors have to work around or remove. Underground utility lines which dictate the placement of the fence or which must be moved by another contractor. Again, fence contractors are usually happy to discuss these issues with you before they begin work. However, you should be understanding if things change while the installation process is underway. Price quotes are not exact and can’t account for hidden issues or unexpected complications. Materials and labor costs make up the bulk of the total cost of a new fence, but there are some other factors as well which you should be aware of. First, be aware of permit needs and requirements from your municipality. Not all cities and townships handle fence permits the same way, and your contractor may need you to get all the required permits before they can begin work on your new fence. Second, if you have an old fence already on your property, it will cost money to tear down and remove it to make way for the new fence. Fence removal isn’t a difficult task in most cases, but it is tiresome and labor-intensive. Most fence contractors are happy to remove your old fence, but don’t expect them to do it for free. Finally, if you are planning to install your fence on your property line, it’s a good idea to hire a surveyor and have your lot’s boundaries marked before you get a new fence. Property disputes over fence position aren’t uncommon. It’s better to pay a little bit up front to protect yourself from future issues rather than run the risk of needing to take down your new fence because it was built in the wrong place. Getting a new fence doesn’t have to break the bank. There are plenty of ways to get an excellent fence at a reasonable price. Call Future Outdoors today at 972-576-1600 to learn more about our fences in Dallas, Texas or visit our Facebook page to see pictures and read more advice.